The Guardsman range of specialty work gloves by VISIONSafe were developed to suit a variety of applications and workplace requirements. These speciality work gloves protect workers hands without restricting the ability to perform precision tasks. Comfort and style are also retained without sacrificing user safety or dexterity. It was these ideas in mind that the Vision Safe team developed the Guardsman range of specialty work gloves. The Guardsman range of speciality work gloves were specifically designed for material handling, while focusing on the needs and safety of workers requiring that extra grip in their gloves. The Gripguard features silicone grip on the palms and fingers, with extra grip on the fingertips. 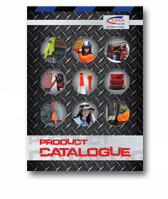 The Gripguard Glove is ideal for handling automotive panels, tiles, and an assortment of other slippery surfaces. With the use of an appropriate cut resistant inner, the non-slip grip pattern is great for moving sheets of metal and glass with the added benefit of leaving the surface mark free and with no messy finger prints or smudges. Tough synthetic leather and reinforced work area’s ensure that the Gripguard are durable and long lasting, which are requirements of all of the Guardsman range. Being fully machine washable the Guardsman Gloves are easy to care for. However, innovative design and tough materials won’t provide any benefit to the user if they are unable to comfortably use the glove. The Gripguard incorporates spandex and Lycra support fabrics to enable maximum dexterity with a comfortable fit. Sizes range from small to 2Xlarge and feature a snug fitting wrist lock to ensure that the glove fits securely.